The replacement of the US 176 Bridge over Cannons Creek in Newberry County has been completed and the bridge is open to traffic. The existing bridge was damaged beyond repair as the result of the flooding of Cannons Creek. The project included the removal of the existing bridge and the construction of a new bridge along with the associated roadway and drainage work necessary to tie the new approaches to the existing roadways. 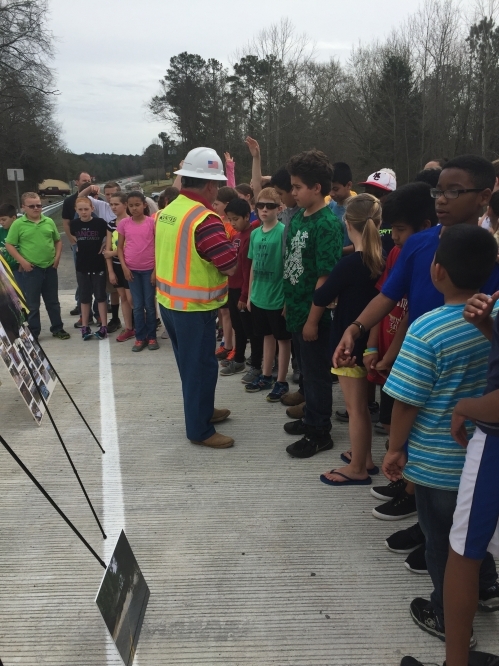 Prior to opening the bridge to traffic, the Design-Build team invited 5th Graders from Pomaria/Garmany Elementary School to the new bridge to learn about the bridge replacement process. The students had the opportunity to view pictures of the damaged bridge before it was replaced and also signed their names on the new bridge with sidewalk-chalk. The bridge was opened 18 days ahead of schedule.